I grew up in a whole food shop in Devon, later, cooking at a variety of camps, retreats and festivals. In 2011 I became pregnant. I miscarried. I had a further 2 miscarriages in the following year.. an inward, painful and distressing time. Now, I reach a place of harvesting rich gold from those traumatic experiences. I am embracing the learnings, dancing new dances. I see the magic around and within. Gratitude for what it woke me to. One festival, at a “Red Moon Wisdom” workshop, I was bleeding. We went deep. My experience felt magnified and life changing. This influenced me to start tracking my cycle. Daily writings and checking in with myself, getting to know myself and the cyclic rhythm of being a woman. I continued to track my cycle, working deeper; sitting in circles with sisters; attending workshops and retreats. 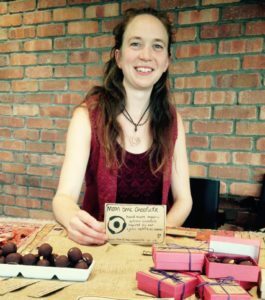 In 2014 I moved from quiet Devon, to the city-world of Bristol where I began working with Radek who already had a well established chocolate business (www.radekschocolate.co.uk). We developed and expanded the company. I was enjoying my new role – a chocolate maker! ~ (the recipe I use is from extreme generosity ~ his original truffle recipe). She came to Bristol to run a workshop – “Unleashing your Creativity”. I felt alive and present at her workshop. Excited for life. Not knowing what would unfold. At the end of the workshop, there was a clarity around something. How to link the two things which are so prominent in my life, which I am passionate about? Many months passed before I tried my first creations. A few friends sampled them, hearing of my young idea. I bought my web domain. I had faith. It was all happening slowly. I needed a push. A deadline. I had many ideas and ingredients ready, but certain things in life kept holding me back. All excuses out the way – I was scared. – of it not working, of it being ‘wrong’! I so wanted to do this. My sisters encouraged and supported me. Thank you for witnessing this unfolding. I thank myself for my patience. May you enjoy these creations. All made with love and understanding of our delightful, intriguing, ever flowing spiral of life. Unfolding with each pain, laugh, cry and smile. Let us know in our hearts that we are loved. All truffles are hand made, vegan and made using organically grown and fairly traded ingredients wherever possible. 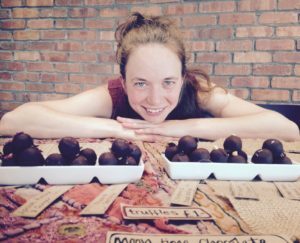 Each truffle is inspired to support and nourish various times of the menstrual cycle ~ but of course can be eaten whether you have one or not.